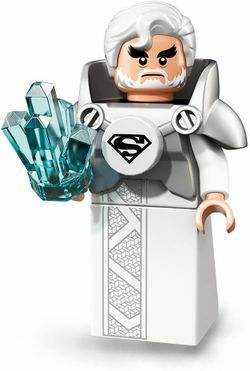 Jor-El is a DC Comics Super Heroes minifigure released in 2013. A new version was released in 2018 as part of the The LEGO Batman Movie theme. Jor-El has tousled dark brown hair and his face is printed with brown eyebrows and a full beard with flecks of grey. He has a dark brown cape. His torso, arms, hips, and legs are dark blue while his hands are flesh. His torso is printed with dark blue neckline. His logo which is a large brown "S" (meaning "hope" in Kryptonian) and some dark gold, the suit's cut on his body, a gold oval and silver embroidery which continues onto the legs. The back printing is similar to that of Superman's Man of Steel variation. Jor-El was a renowned scientist on Krypton married to Lara Lor-Van. He attempted to warn the Kryptonian council about Krypton's destruction due to its unstable core and wanted to send a Kryptonian genetics codex to other worlds to save their species, but the council refused. General Zod, his old friend, and his army then arrived and tried to overthrow the council, and Zod offered him a place in reshaping Krypton's government. Jor-El refused, escaped and stole the codex. He returned home, and imprinted the codex on his newborn son, Kal-El, who was the first naturally born Kryptonian in centuries. They prepared to send him to Earth before Zod arrived, and when he did, Jor-El fended him off, long enough for Lara to launch Kal-El's ship. Zod then killed Jor-El in rage. Clark Kent (Kal-El's Earth name) discovered an ancient Kryptonian scout ship, and inserted Jor-El's artificial intelligence into the ship's mainframe. Jor-El explained Krypton's history, Zod's intentions, and why he was sent to Earth. He also presented Clark with his uniform. Lois Lane later called on Jor-El to help her escape Zod's mothership. Jor-El helped his son escape the ship and sent him to stop Zod. Zod took control of the scout ship and Jor-El attempted to talk him out his plan to turn Earth into a new Krypton. However, the sectarian forced the A.I. to disappear and seemingly destroyed it. As Batman and Robin arrived at the Fortress of Solitude to steal The Phantom Zone Projector, Batman encountered Superman and the rest of Justice League celebrating their anniversary without him. Simultaneously, Robin made his way to the atomic cauldron to steal the projector. Soon, leaving to assist his son, Batman found Jor-El's knowledge crystals, activating a projection of him explaining their purpose. Ignorantly, Batman began destroying the crystals, allowing for the deactivation of the projection and the barrier guarding the cauldron. Jor-El is portrayed by Russell Crowe in the 2013 film Man of Steel. This page was last edited on 12 January 2018, at 02:14.